After running around the country for the past few days I’m having a quiet Saturday in Surrey. I’m here with Dawn’s family to attend the local Tilford fete. I’ll be posting some pictures from the raft race and other organised mayhem later. 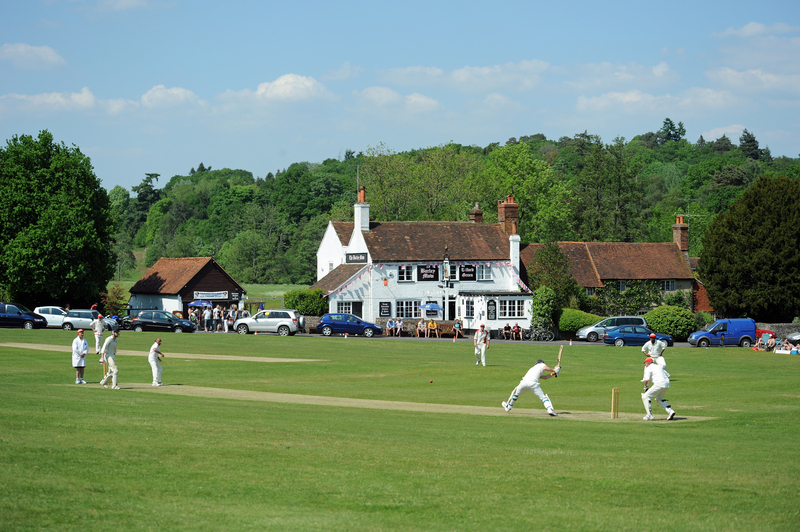 Tilford’s a quintessentially English village, as this picture shows, with cricket played on the green outside the village pub. The Institute in the background was designed by Sir Edwin Lutyens, who later went on to design New Delhi! Here’s the first few pictures from the fete. You can tell it’s a bank holiday, it’s raining! Well unless you’re back in Yorkshire and other parts of the North where it’s been snowing. Here in Surrey we’ve not seen any of the white stuff – just plenty of rain. Due to the weather we’ve had another relaxing day which kicked off with brunch in Farnham where the family were met by a friend and her sun for a leisurely brunch. Afterwards we returned to Tilford where the local pub (the Barley Mow) was having an event to celebrate the 100th anniversary of the formation of the Royal Air Force. The Farnham Brass band played in the beer garden whilst inside a variety of musicians, singers and dancers entertained in the warm and dry! I had to feel sorry for the brass band as the conditions were less than ideal. With Easter being late this year you would have hoped for better weather, but then – that’s bank holidays for you! Here’s a few pictures from the pub. Good job ‘Singing in the Rain’ was part of the bands repertoire! The weather may not have defeated the brass band but it certainly encouraged us to retreat into the warmth of the pub where we stayed to hear ‘The bunker girls‘ (who’d come all the way from the Isle of Wight) belt out a few old tunes. We’re spending the weekend with my partners brother and his family down in Tilford in Surrey. It’s one of those very pretty English villages loved by crime writers and airline adverts. There’s cricket on the green outside the local pub. How many hostelries are there when you can you sit outside facing the crease, supping a pint whilst keeping a wary eye out for the occasional errant cricket ball that careens off the pub like a cannonball? Another side of the green is bordered by a meandering stream where the kids go to splash & swim whilst their parents sit with picnics & prosecco. The old single track, stone arched bridge across it is guarded by a huge world war 2 concrete pillbox which would make a great location for ‘Dads Army’ – or a local branch HQ for UKIP. On the far side of the green is a lovely village hall which was designed by Sir Edward Lutyens (his ambitions didn’t stop with village halls as he later went on to design that jewel in the Empire’s crown & capital of the Raj: New Delhi). It’s all, terribly, terribly English!